The o-DISC was used to help gather data about the swimming activity and bearing relative to their home reef of larvae. Courtesy of Michael Kinsgford. Observing the behavior of larvae, which are equipped with a complex toolbox of sensory apparatuses, in response to signals within the ocean is crucial to help understand their movement within their marine environment. Dr. Claire Paris, Associate Professor of Applied Marine Physics at the University of Miami, is researching this behavior, specifically in relation to the orientation of larvae and their responses to cues in situ, meaning within the field. Evidence was found at One Tree Island in the Great Barrier Reef suggesting that fish larvae navigate to their home reef based on odor signals they detect in the ocean water. The main method of data collection was a device called the Ocean Drifting In Situ Chamber (o-DISC). 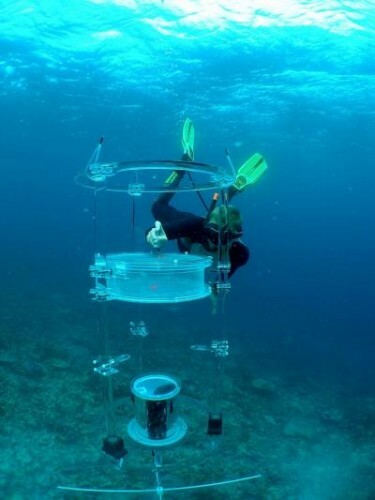 This device contains a circular chamber where fish are placed and monitored. Ambient conductivity, temperature, and depth are recorded as the device moves with the current. The device is open to ambient water and transparent to turbulence to minimize visual disturbances to the larvae. Larvae swimming activity, their bearing, as well as specific responses relative to the ocean and plume water were observed. These data were all dependent on the odor cues the larvae received from the environment. It was determined that these fish can discriminate between odors coming from many different nearby reefs and are keen on the odor of their home reef. 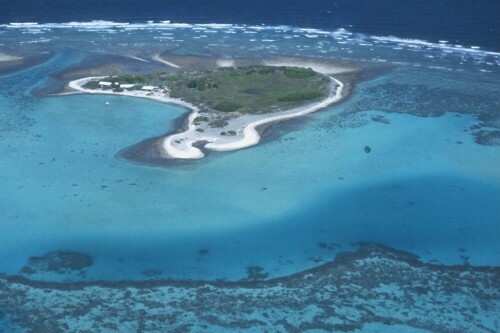 One Tree Island, located in the Great Barrier Reef, is where this study was conducted. One Tree island was chosen because it is the outermost reef of the Capircord-Bunker reef group and borders the open ocean, so the distinction between reef and ocean water is more obvious. Courtesy of James Cook University. A total of 83 larvae of two taxonomic groups, Pamocentridae (damselfish) and Apogonidae (cardinalfish) were observed by the o-DISC. Different species vary in how they navigate based on different odor signals and how they follow these distinct directional cues. The two species observed in this experiment displayed very different responses to detected odor cues. Cardinalfish zigzagged within the o-DISC and sped up when they detected an odor cue. Their movements suggested they were using infotaxis, or sporadic odor cues, to orient themselves toward the reef. In contrast, damselfish slowed down and oriented themselves specifically along the shoreline and to the west, following some sort of internal compass. Though studies have been done on more mature fish to show that they also navigate based on odor, this was the first study done on larvae. Human activity, such as pollution and acidification of the oceans, might have an impact on the odors within the ocean and could interfere with these specific signals that larvae use to locate their home reef. As a result, this interference could endanger the larvae by putting them at risk of predation. This information may help in promoting the reduction of pollution and waste that is discarded into the ocean. It also suggests that future work could be done in utilizing the traveling patterns of larvae to help preserve endangered species or to limit fishing territory. The two different species of larvae observed showed different responses to odor cues. Larval bearing were computed relative to a cardinal frame of reference, the ocean and plume water shown in the figure. Each dot represents an average individual bearing. The arrow points in the mean orientation direction of individual-level bearings. Courtesy of Claire Paris.